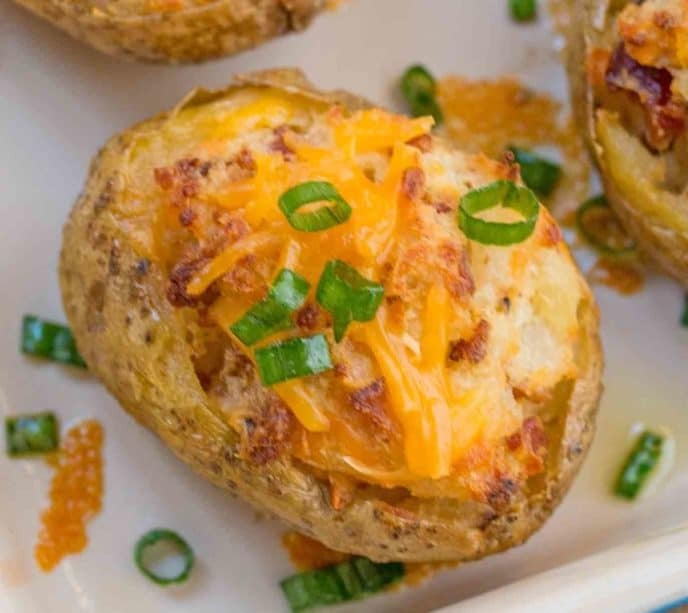 Twice Baked Potatoes made with russet potatoes, cheddar cheese, sour cream, and bacon are creamy on the inside and crispy on the outside, and incredibly EASY to prepare! We love entertaining over here, and these baked potatoes pair perfectly with our Perfect Easy Ribeye Steak, Ultimate Slow Cooker Pot Roast and Slow Cooker Brown Sugar Garlic Chicken. 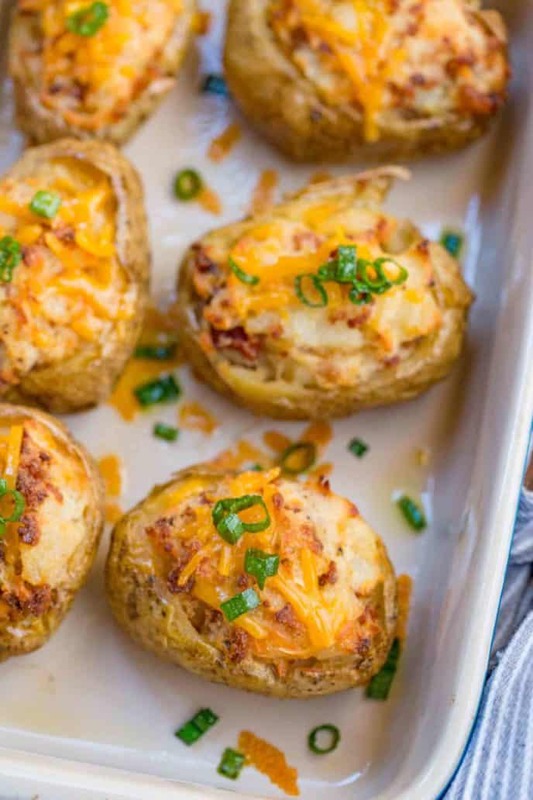 Twice Baked Potatoes are basically the perfect party food. You can serve them as appetizers or as a side dish with dinner. They can be made earlier in the day, or the day before. I haven’t met anyone yet who doesn’t like a crispy potato skin filled with a buttery, creamy, cheesy mashed potato filling and bacon. Not to mention they are incredibly kid-friendly. My youngest LOVES helping me put them together, especially sprinkling the cheese and green onions (you can also use chives) on the top at the end. If you don’t have sour cream, you can make an extra creamy potato filling by substituting it with cream cheese. I’ve also added gruyere and mozzarella instead of shredded cheddar, basically use whatever you have in your pantry. These are a step up from baked potatoes, so there’s a lot of flavor combos you can try. This is also hands down one of my favorite side dish potato recipes of ALL time. WHAT POTATOES SHOULD YOU USE FOR TWICE BAKED POTATOES? Twice baked potatoes are usually made with russet potatoes. Russets have a hard enough skin to hold up to the scooping and baking, plus they get nice and crispy in the oven which is the perfect texture against the creamy filling. You can also make Twice Baked Sweet Potatoes. CAN YOU MAKE TWICE BAKED POTATOES AHEAD? Twice baked potatoes are perfect to make ahead. Bake the potatoes according to the recipe up until the filling is prepared and they’re ready to bake again. Instead, place them in a baking dish and wrap the dish tightly with plastic wrap and refrigerate. This means you can prep them 1-2 days beforehand and bake when you’re ready to serve. 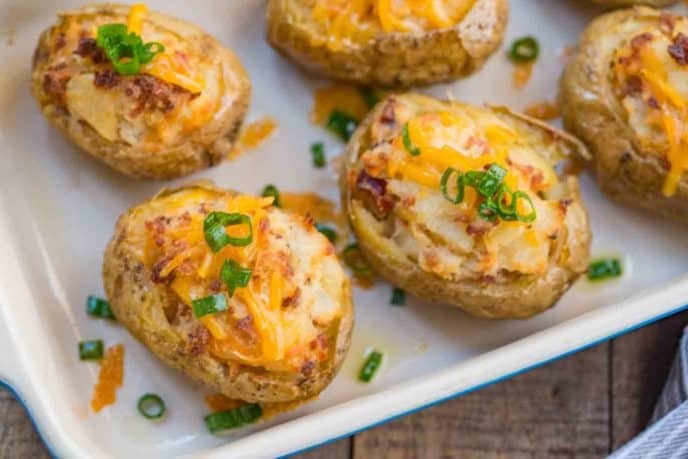 I’ve also set up baked potato bars where I mash together the filling with the milk, sour cream and spices, but let guests choose their cheese and toppings like bacon or veggies, then bake them all together. CAN YOU FREEZE TWICE BAKED POTATOES? Another option is to freeze the potatoes instead of putting them in the refrigerator. Just prep them up until the second bake, then instead of baking them wrap them tightly in plastic wrap and freeze. You can take them straight from the freezer to the oven, just add a few extra minutes of cook time. Twice baked potatoes will last about 3 months in the freezer. HOW LONG DOES IT TAKE TO REHEAT TWICE BAKED POTATOES? Twice baked potatoes are really easy to reheat. Preheat your oven to 400 degrees F. Then line a baking sheet with parchment paper and place the potatoes evenly spaced on the sheet. Bake for 10-15 minutes, or until they are warmed through and the cheese has melted. You can also reheat these in the microwave for 2-3 minutes. I recommend using the oven, especially if you’re serving these as a side dish, because it will ensure that your potato skins stay crispy instead of being too soft. HOW LONG WILL TWICE BAKED POTATOES KEEP? These will keep in the refrigerator for 2-3 days tightly wrapped in plastic wrap, so you can prep this side dish ahead of time and pull them out when you’re ready to put them in the oven. Twice baked potatoes are perfect to make as an appetizer for a party, or if you’re just in the mood for some homemade pub food. Make these with pepper jack cheese and top with salsa for a Tex-Mex version! If your potatoes aren’t crispy on the top after the total time is up, turn on the broiler for 2-3 minutes, but watch them really closely so they don’t burn. Chive and sour cream is a classic combo, but potatoes are bland to start with so don’t feel limited to one type of cheese or filling. Try cheddar and broccoli, grated parmesan and sun dried tomatoes, or mushroom and Swiss. The filling is a lot like making mashed potatoes. 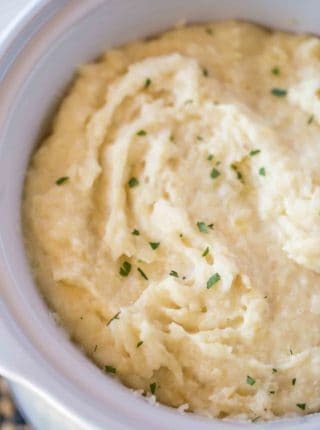 Get the texture extra smooth and creamy with a potato masher, or by pureeing in a food processor. Wash the potatoes and rub them with coarse salt and a teaspoon of olive oil (or olive oil cooking spray) before baking. 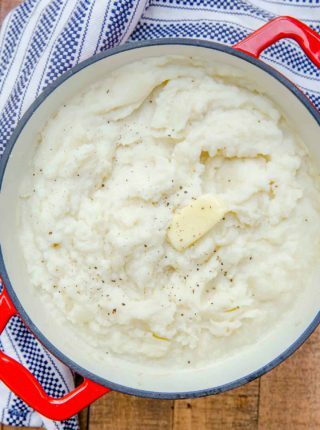 This is a restaurant trick that adds extra flavor to baked potatoes. Then when you half lengthwise, fill the potato shells and bake, they’ll be extra crispy! Preheat the oven to 400 degrees and rub the canola oil over the potatoes, place them on a baking sheet and bake for 60 minutes. 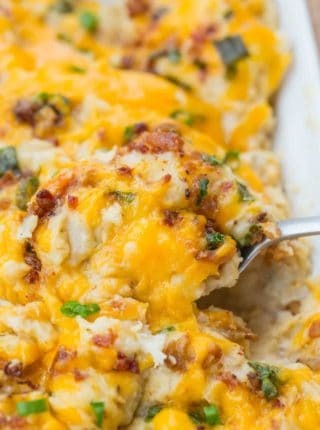 Cut the potatoes in half horizontally and scoop out all but 1/2 inch of the wall of the potatoes and place into a large bowl with the butter, bacon, sour cream, 1 cup of cheddar cheese, milk, salt, pepper and most of the green onions and mix well together. Scoop the mixture back into the potato halves, top with remaining cheddar cheese and bake for 18-20 minutes before garnishing with remaining green onions. So glad you enjoyed it, Margot! These are a family favorite! Perfect for the holidays. 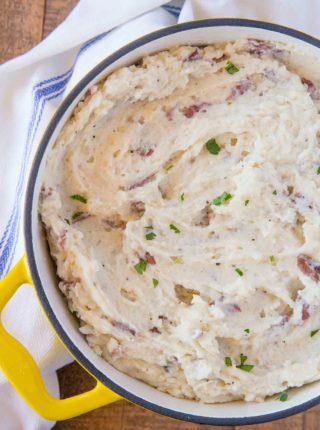 One of our favorite potato recipes! 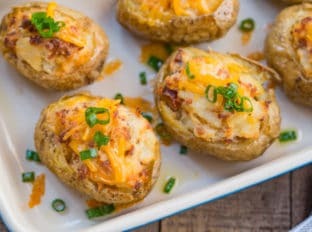 I cant tell you how much we love twice baked potatoes and this recipe is simple the best one! So stinking good! My family loves twice baked potatoes! Love making these when we have guests over. Hello delicious side dish! Come to mama. Sorry couldn’t wait for a response lol. I made it with yukon golds, and even though skin didn’t crisp up, they were delicious none the less. It took about 1 1/2 hours in oven. Also I used extra sharp cheddar and extra green onions, just my preference. Thanks for the recipe! So sorry to have missed your question but I’m glad that it worked out for you! Can’t wait to make these, but all I have are yukon golds. Do you think they will work? Thanks!